You'll be £8.00 closer to your next £10.00 credit when you purchase The Trafalgar Chronicle. What's this? 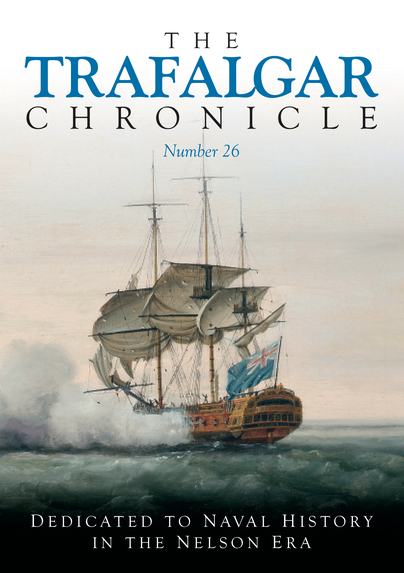 The Trafalgar Chronicle, the yearbook of The 1805 Club, has established itself as a prime source of information and the publication of choice for new research about the Georgian navy, sometimes also loosely called ‘Nelson’s Navy’. Successive editors have widened the scope to include all sailing navies of the period, while a recurring theme is the Trafalgar campaign and the epic battle of 21 October 1805 involving British, French and Spanish ships, and some 30,000 men of a score of nations. Contributors to the Trafalgar Chronicle are the leading experts in their field, whether they are Professor John Hattendorf from the US Naval War College in Newport, RI, Professor Andrew Lambert from King’s College, London, or antiquarians and enthusiasts. Each volume is themed and this new edition contains a particularly Anglo-American flavour, focussing on North America and North Americans in Nelson’s Navy, with one article, for example, describing how the US National anthem was composed onboard a British warship. More than eighteen articles offer a huge wealth of information and new research and include such diverse subjects as the true colours of Victory and the story of the little known American, Sir Isaac Coffin, who helped carry the pall at Nelson’s funeral. Handsomely illustrated throughout, this yearbook casts intriguing light on that era of history which forever fascinates naval enthusiasts and historians alike. There is a wealth of fascinating information published here in The Trafalgar Chronicle - it is to be dipped in and relished at leisure. This is the first volume of articles on the subject of the Georgian period navy, ie. The epoch of Trafalgar, Nelson, Napoleon, 1812 war etc. The volume contains 17 individually authored articles, maps, quality black and white and colour plates, notes and contributors’ biographies. For this general reader, most of the articles were very interesting, but some contained a level of detail which would be more of interest to researchers. The crucial role of James Cook in the conquest of the French in Quebec was fascinating to this antipodean, who was not previously aware of this period of Cook’s career. I look forward to further volumes in this series which are intended to be published annually. The Trafalgar Chronicle offers a tantalizing look into forgotten or overlooked subjects. Its contents will enlighten all readers, and sometimes entertain them. When the back cover closes, each will have their own favorites for many different reasons, myself included. For example, Rear-Admiral Callo’s article allowed me to glimpse the history behind a novel I recently read. Charles Freemantle’s offering not only introduced me to his ancestor, but also allowed me to see Baltimore and its environs in the past through the eyes of a stranger during a time of war. These are but two of mine, although all the contributions taught me things I didn’t know. The next yearbook, whose emphasis will be on Royal Marines and the US Marine Corps during the Georgian Ear, sounds equally intriguing. This is a fantastic publication! Well produced, well designed with good illustrations and cleverly edited. It is indeed a prime source of information about the navy of the Georgian era - often referred to as 'Nelson's Navy', which is a bit unfair given the tens of thousands who served during this time. We were blessed with a lot of remarkable naval officers. The Trafalgar Chronicle reaches out beyond Nelson and these pithy, well-researched articles are both informative and enjoyable to read. In fact some feature brand new material and insights and one can see why it is already the publication of choice for new research about the Royal Navy during the 18th and early nineteenth centuries. I particularly enjoyed the focus in this New Series issue on Britain's relationship with the United States - the history of this friendship, and occasional conflict! between the US Navy and the Royal Navy is important to our understanding of the so-called special-relationship. This is not just another history book!